PHOENIX -- Philadelphia Eagles executive vice president of football operations Howie Roseman made one thing perfectly clear during his session with reporters on Monday at the NFL owners meeting: Signing quarterback Carson Wentz to an extension is a priority and central to the Eagles' plan going forward. "It's important to us that we have relationships with our players where we keep things in-house, and contract talks are a big part of that," Roseman said when asked about the timing of such a deal. "But obviously, having Carson here long-term is our goal, and we'll work toward that." 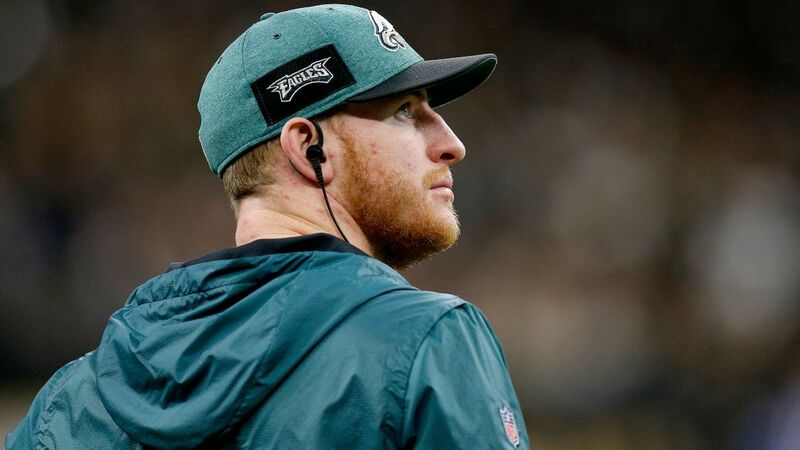 Speaking in the courtyard at the upscale Arizona Biltmore, home of the NFL's power brokers for the week, Roseman said that management has been talking about the prospect of a long-term deal for Wentz for the past two years. "I think that once you see the type of impact that he can have on the field, the kind of player he is, the type of work ethic he has, you start planning about how you're going to build a team around a highly paid player at that position," he said. "Obviously, we're getting to the point where that's going to become a reality, so some of the decisions that we have to make are going to be influenced by that. We're trying to plan by getting more young players into our system." The Eagles did not waver in their commitment to Wentz, despite Nick Foles' heroics the past two seasons. The Eagles let the Super Bowl MVP exit via free agency, tying their fate to the former No. 2 pick out of North Dakota State who was on track for league MVP in 2017 before suffering a torn ACL and LCL. Wentz had another season cut short due to injury this past year after a stress fracture was detected in his back in December. Roseman declined to get into specifics about Wentz's recovery but said of "all of those [injured] guys, they're working hard. We're incredibly optimistic about where we are in that area." Wentz has expressed optimism that he will be ready when the offseason training program begins in April. The Eagles can exercise patience when it comes to re-upping Wentz, as the team has him under control at a reasonable number for the next couple seasons. He is scheduled to make a base salary of $720,000 in 2019 and carries a cap number of about $8.5 million. The Eagles have until Dec. 31 to exercise his fifth-year option for 2020, which they almost certainly will. Wentz's salary that year is likely to be about $23 million. Holding off on a monster contract would allow the team to gear up for another title run with Wentz at a low cap number and see how things go health-wise before investing major dollars in him. The downside is that the longer the Eagles wait, the bigger Wentz's price tag becomes if he lives up to expectations. "If Wentz is ultimately who you think he is, you're probably going above $35 million per year when it's all said and done if you wait because Russell Wilson is probably going to get there on his next contract," cap expert Joel Corry said. The timing of a new deal is still to be determined, but the Eagles are prepping for what they view as an inevitability. "We want to have a team led by a franchise-type quarterback," Roseman said. "We know that we have that in Carson, and so now what are we going to do around him to make sure that we can continue to try and compete for championships?"